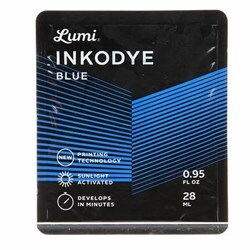 Lumi Inkodye - Blue - 8oz Bottle has not been rated yet. Inkodye is an amazing new way to print t-shirts and textiles. Its color develops and binds permanently when exposed to bright sunlight or UV. Inkodye is water-based and available in nine mixable colors. Inkodye can be brushed, rolled, dipped, stamped, stenciled, screen printed, and more! 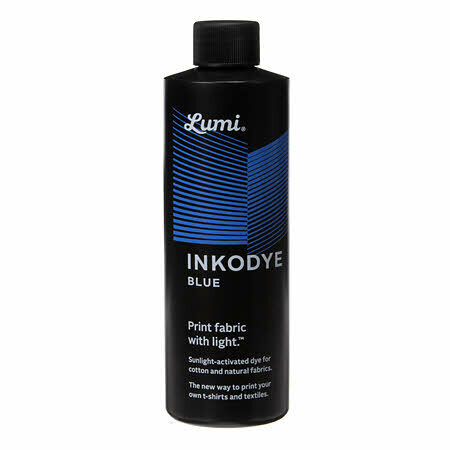 Inkodye binds permanently to any natural fabric such as cotton, rayon, linen, canvas, silk, and more. Results are soft to the touch and can be machine-washed without fading. click Here to see All our Lumi products and Fun Project Items!